The Greater Vancouver Chamber of Commerce (GVCC) has increased their Small Business Saturday Grant program distribution total from $4,000 in 2017 to $6,000 in 2018. Three $2,000 Small Business Saturday Grants will be available to GVCC members with 15 full time employees or less, who are eligible to compete in a social media hashtag contest which starts on November 1st and ends on Small Business Saturday, which falls on November 24th this year. Currently, over 100 members are enrolled to participate, ranging from start-ups, professional services business, retail, and nonprofits. The 2017 grant recipients were: Sweet Spot Skirts and Funky Fresh Juice Co. 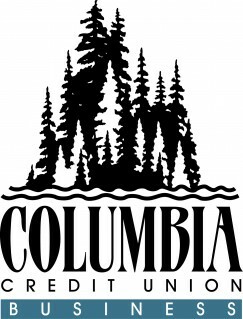 The Chamber’s Grant program is sponsored by Columbia Credit Union. An program overview document that explains the program and covers fundamentals on how the social media hashtag contest works (to award the grant) can be sent. The Small Business Saturday Grant program is a November-long marketing framework for small businesses, organizations, and nonprofits to engage customers, clients, vendors, employees and/or community members to post on their behalf. Public posts between Nov 1-24 that contain the chamber’s #GVCCgrant2018 hashtag and identify the business the post was promoting serve as an entry on behalf of that business for the grant funds. There is no voting, its quality over quantity. Last year, hundreds of posts circulated in November to launch the shop local holiday message and showcase Southwest Washington’s small businesses community. 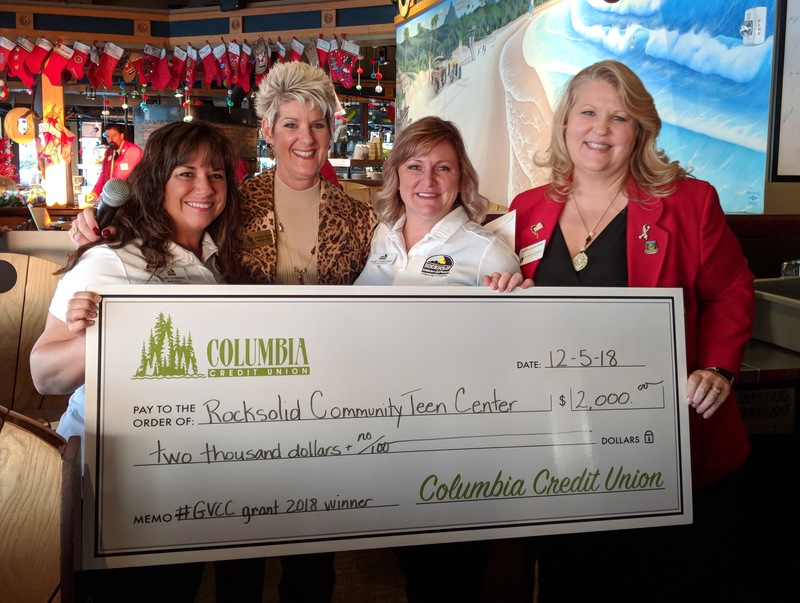 The three $2,000 grant recipients will be chosen via a four-person committee, consisting of two GVCC staff and two Columbia Credit Union staff, who cast their votes for the “best post” from a list of 20 contest finalists. 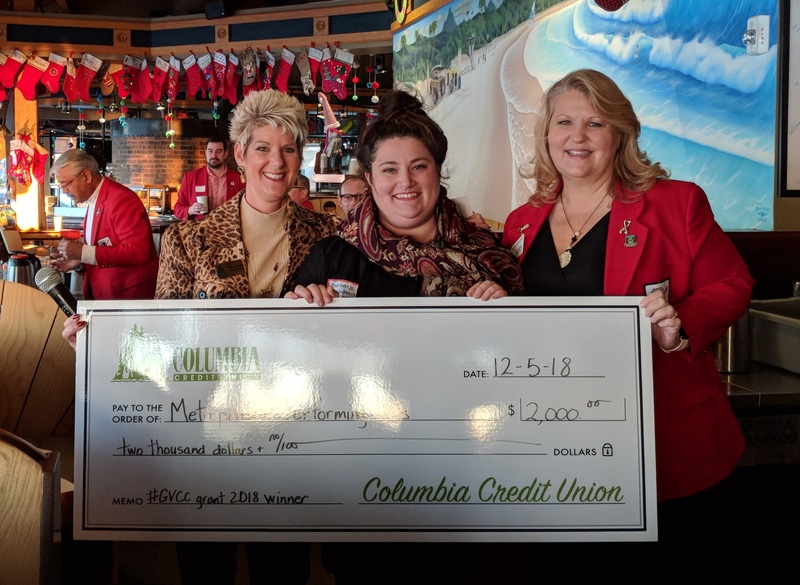 The three $2,000 recipients will be awarded their grant funds at the Wednesday, December 5th Southwest Washington Leads & Needs event by Columbia Credit Union and the GVCC. 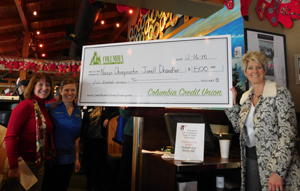 "As a community-based business, Columbia Credit Union was excited to once again partner with the Greater Vancouver Chamber of Commerce to offer the Small Business Saturday Grant Program. It was my pleasure to present Funky Fresh and Sweet Spot Skirts with their $2000 checks to help boost their business." - Michelle Thor, VP Outreach & Social Responsibility at Columbia Credit Union. Grant recipients will be chosen from social media posts between November 1st and November 24th which is Small Business Saturday. Eligible posts must include our contest hashtag #GVCCgrant2018, be set to public, and identify a participating business - that is it! Nexus Chiropractic won in 2015 by a heartfelt post from a patient. Maddogs won in 2016 by a post made from their partners at Innovative Services NW. Frunky Fresh Juice Co. and Sweet Spot Skirts won in 2017. The social media contest is a perfect opportunity to reach out to past customers, clients, vendors, employees, supporters, and partners and ask them to share about your business online. After Small Business Saturday (contest end date - November 24th this year) a small committee will choose the "Best Post" from our membership base that is enrolled in our program (no additional cost to membership). NW Injury & Rehab Center P.S. Do you want to join the program? Email Sarah Cooke for more information on how to be enrolled in November 2019. 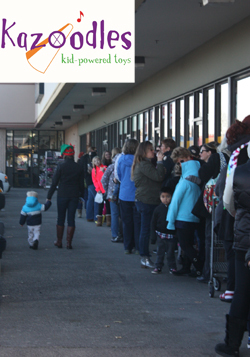 The line around the block at Kazoodles Toys in East Vancouver on Small Business Saturday. 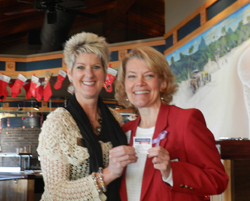 Columbia Credit Union was on site, handing out gift cards during one of their "Making Life Better" moments. Michelle Thor and Shannon Decker of Columbia Credit Union present Janelle Chandler of Nexus Chiropractic with the $500 Business Grant Check. Nexus Chiropractic was the winner of the first social media #localthanks hashtag contest. Her employees and clients posted a number of fantastic posts praising her professionalism and skill as a chiropractor. Great job Janelle! In 2014 the GVCC hosted a customer appreciation contest as part of the "Get Out On... Small Business Saturday" campaign. Each participating small business received an entry box for their customers. The prize: a $500 "Shop Local" gift certificate to be used at their place of entry. Each time a customer shopped/used services they were entered in the drawing as a THANK YOU. The winner was Brett Herr, a customer from Self Balance Massage. We called and credited his $500 prize to his name. 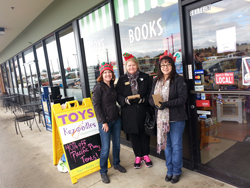 In 2014 Columbia Credit Union visited Mary Sisson, owner of Kazoodles toy store in Vancouver and handed out surprise amount gift cards to shoppers. 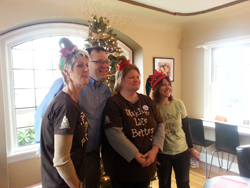 Sisson reported a record day of sales on Small Business Saturday. "We had our best day of sales in 8 and a half year in business. 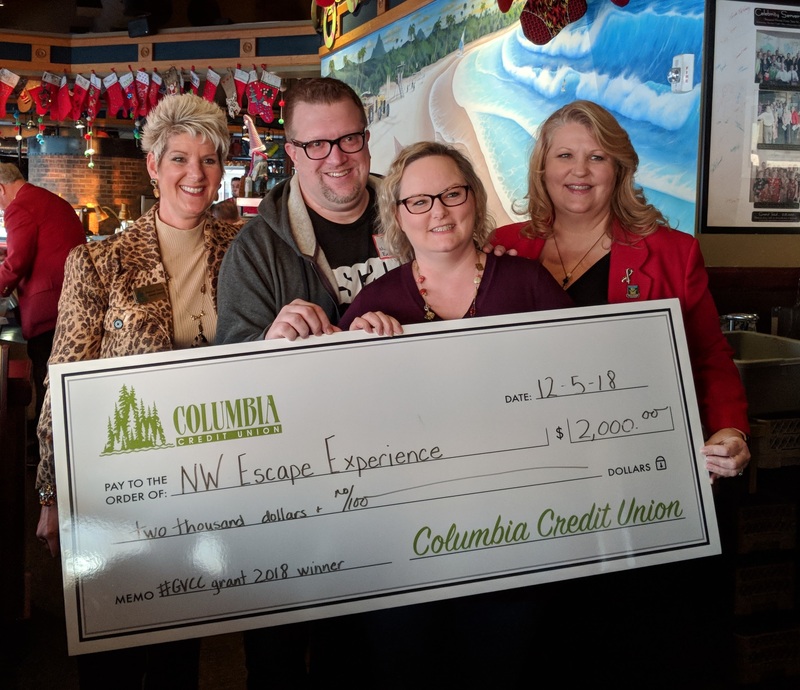 My thanks to Columbia Credit Union who were onsite with their Making Life Better Moments and handed out free gift cards to shoppers in the morning and to the Chamber," she said on December 3rd to the networking group at SW WA Leads and Needs. In 2013 (in the programs first year) the team at Columbia Credit Union surprised the community on Small Business Saturday at two locations. First they went to Latte Da Coffee and handed out $5 gift cards. 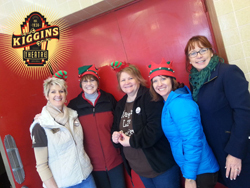 Then, they hosted a free holiday movie at the Kiggins Theatre! They handed out extra goodies as the community piled into our landmark theater to enjoy a free viewing of ELF.